The Aluminium Security Grille is designed to provide security for internal applications with provisions for ample vision and ventilation. 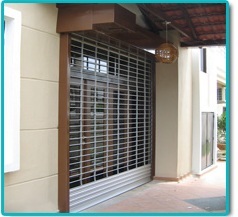 It is designed to suit security closures to entrances, passages, doorways, bars, cash and servery counters. It is also recommended for partitioning areas such as clubs, hotels, shopping centres etc. Maximum Height: 3600mm* Maximum Width: 3600mm* *Total door size shall not exceed 10m. The curtain shall be constructed using 12mm diameter tube of 1.2mm thick aluminium. The tubes are spaced at 50mm centres in height and fitted with molded hi-density polyethylene notched section link hinged links at 210mm centres to form a brick type pattern design. Tapered bottom rails can be manufactured to suit the opening (limitations may apply). 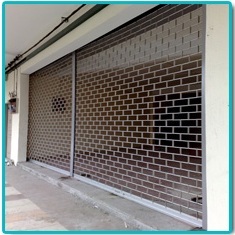 Reverse roll installations are possible and will not affect the appearance of the Roller Grille curtain. All aluminium sections can be natural anodised as standard. Various anodising and powdercoat colours are also available when specified. Polyethylene hinge links are available in selected colours only, consult Airport Doors for current colour availability. The bottom rail shall be specially extruded section 2mm thick measuring 123mm in height. It shall have access incorporated into the body of the rail to house a concealed locking system. Provision is available for bottom seals as an option. Locking shall entail a centrally mounted, concealed key operated lock focus; security type lock mechanism. It shall be keyed on the outside or inside (or both sides) fitted onto the bottom rail of the Roller Grille. In special cases the lock can be fitted into the midlocking rail to facilitate with waist height lock system. Master Key Locking System (Optional) is available using either: Lockwood 570; NOTE: The barrel protrudes out by approximately 25mm therefore considerations should be taken to avoid damage.Lock Focus V9C4; with spin cylinder and sleek appearance with lock protruding only 14mm. Shoot bolt system mechanism is also available as an option, which is not concealed as standard locks. Padlocks not supplied by Airport Doors. Centre door mullions can be used for wide openings and multiple door installations. Standard centre mullions shall be extruded aluminium of 125mm width and 30mm depth. The mullions shall always be incorporated with mullion head which is positioned above the mullion. The mullion shall be a lift-out type, fitted with shootbolts locking at the bottom of the mullion. In case of fixed mullions the mullion and the head are a single unit and not removable. Corner mullions can be used when two grilles meet at a corner. The mullion shall be manufactured from aluminium sheets formed to suit the angle and size as required. The width of the angular corner mullions can be minimised if the drums are vertically staged when installed.